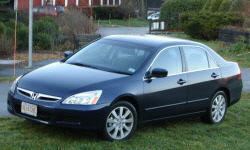 Extremely reliable, I havent had a problem with my accord after almost 4 years of ownership. The engine manages to get decent fuel economy, while still managing to provide the right amount of power so the car doesnt feel slow and sluggish. It handles well, the steering has a fairly light feel to it. Honda is known for its reliability and practicality, and the cars come with a reasonable price. Honda dealerships were friendly and provided great incentives to buy the car. Everything inside the car feels cheap and junky, I suppose thats what you get for the price though. The car becomest extremely noisy after a year or two of ownership. Ive been on quieter airplanes then my accord while im driving it on the highway. Not adequate legroom unless the passenger is 5 feet tall and has small feet. Interior seems like garbage, and doesnt look aesthetically pleasing either.